PRINCETON, NJ -- Baby boomers at the older end of their generation feel better about their finances than do those at the younger end. 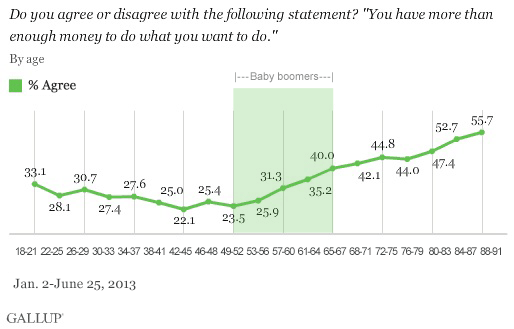 The percentage of Americans who agree that they have "more than enough money to do what you want to do" rises across the baby-boom years of 49 to 67 and continues to increase as adults move into their 80s -- suggesting no pending era of increased financial angst as the huge baby boomer generation moves into retirement age. The population of Americans aged 65 and older will swell dramatically in the next 15 years as the older generation of today is replaced by the huge number of baby boomers who were born between 1946 and 1964. Any signs of heightened financial worries on the part of baby boomers as they age could be cause for concern, given that there are so many of them, and given concerns that future retirees may not have adequate financial resources to sustain themselves in an era with fewer pensions and potentially less income from sources like Social Security. An analysis of several questions measuring attitudes toward finances and spending that have been included in Gallup Daily tracking surveys in 2013 would appear to belie these concerns. There are few signs that the older, leading edge of boomers are beginning to worry about their finances, even as many of them move out of the labor force. On the contrary, Americans generally become more positive, rather than less so, as they age past their late 40s and into their retirement years. 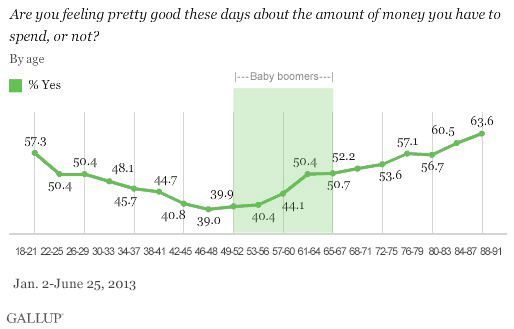 Americans become more likely to say they are "feeling pretty good these days about the amount of money" they have to spend as they enter their 50s. Younger Americans are actually almost as positive as those of older ages on this metric, but attitudes worsen among Americans in their late 40s, before improving again. 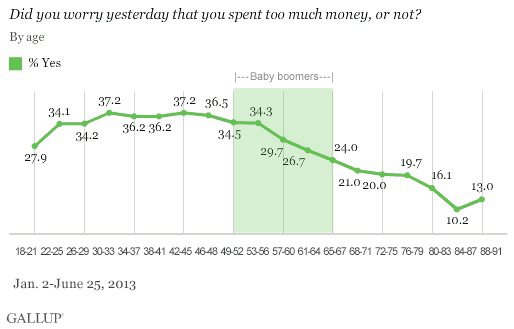 Similarly, worries about having spent too much money "yesterday" also begin to drop off among baby boomers, falling steeply through age 87. This daily worry about spending is relatively low among the youngest adult Americans, but rises to its highest levels among those in their 30s and 40s, before beginning to fall. 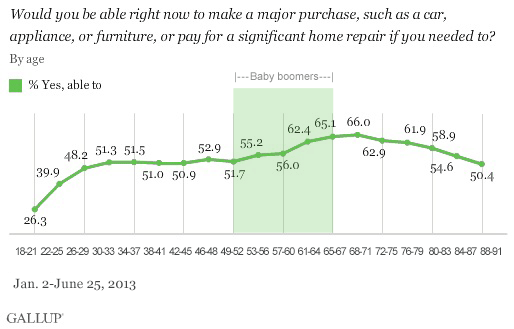 Americans also become more likely to say they have the ability to "make a major purchase, such as a car, appliance, or furniture, or pay for a significant home repair if you needed to" as they enter their 50s and 60s. However, the percentage who say "yes" to this declines as Americans enter their 70s. Americans are least able to say they can make a major purchase in their late teens and early 20s. These attitudes have significant implications for the U.S. economy and commerce in the years ahead. The fact that Americans of advanced age generally have the most positive views of their own financial situations and their own spending is important because of the pending expansion in the number of Americans aged 65 and older. If the current patterns hold, the country as a whole will have increasing numbers of older citizens who are generally not worried about their finances, which could augur well for the overall health of the economy. And although Americans in their late teens and 20s appear to have less money on hand, they seem OK with this situation, perhaps because they anticipate an enhanced income stream as they mature into their 30s and 40s. Unfortunately for these Millennials, however, worry about money appears to peak in the middle-aged years they have in front of them. These results are based on telephone interviews conducted Jan. 2-June 25, 2013, on the Gallup Daily tracking survey, with a random sample of 21,619 adults, aged 18 and older, living in all 50 U.S. states and the District of Columbia. For results based on the three and four year age groups represented in the graphs above, one can say with 95% confidence that the margin of sampling error is about ±3 percentage points; the precise margin of error varies depending on the size of each age group. Fewer Americans express optimism about their future personal finances now than did so in mid-2012. Americans are as likely to say they are financially better off as worse off now compared with a year ago. Nearly one in three Americans prepare a detailed household budget -- a majority do not. Americans are also more likely to use an online program than an accountant or financial planner to manage their money. In the U.S., 46% of nonretirees expect to live comfortably in retirement, up from 37% last year, but still below pre-recession levels. Younger nonretirees are much more optimistic than older nonretirees about a comfortable retirement.